The Sterling Leather Executive Chair has that sculpted look that gives off a modern and opulent vibe. 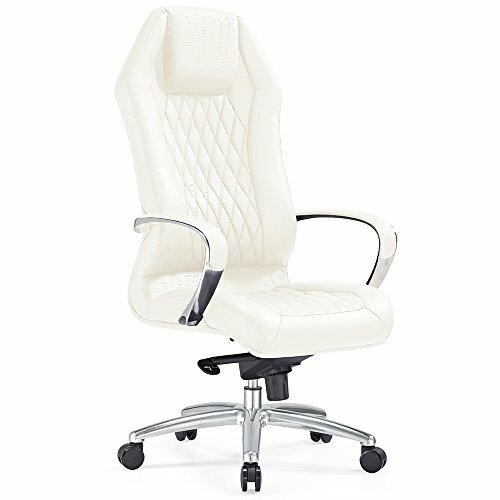 Protect your back from aching while working long hours with this chair's curved lumbar and head support with padding. The seat and back are embossed with a lattice pattern on luxurious leather upholstery, while the armrests offer a sleek modern touch with the curved metal construction. This swivel chair features durable casters for mobility and height is fully adjustable. W 25.5" x D 21" x H 50-53"; Seating Height: 18-21"; Seating Width: 20"